I was once had a conversation with a friend where we both tried to think of an instance of Frisell playing standards. The only example I could think of was his playing with the Ginger Baker Trio, doing songs like "Straight, No Chaser" and Ornette Coleman's "Ramblin' ", and his work in the News For Lulu trio, but they covered fifties hard bop, not time tested standards. Imagine my surprise and delight when I found out about Songs We Know. 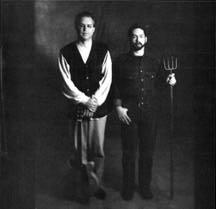 Frisell and pianist Fred Hersch play the most standard of the standards in a completely unstructured environment. I couldn't have wished for anything better. This album finds Frisell completely stripped of effects and bells and whistles, his electric guitar sound being more similar to Jim Hall's quiet near acoustic tone. No country twang or rock edge here. He gambols around these melodies with Hersch, obviously having a lot of fun with them. There was no real plan involving the songs, they just called them and played. With so much space to fill, this album could have fallen apart, but the album succeeds because it avoids the head-solos-head format. 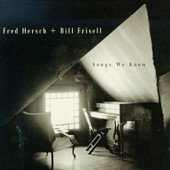 Hersch and Frisell instead just create sounds based around the chords and melody of the songs, keeping the melody running through the entire piece (a method sorely lacking in a lot of todays jazz). The songs work best when played impressionistically, drifting along with a light touch. "It Might As Well Be Spring", "My One and Only Love" and the haunting version of Jobim's "Wave" all stand out. The clompy versions of "There Is No Greater Love", "Softly as in a Morning Sunrise" and "Blue Monk" all sound a little bit strained. This album does have a very quiet, reserved beauty all its own, and is probably best for Frisell completists. It is an invaluable chance to hear Frisell in a radical new environment for him, sticking pretty close to a jazz vein and not really bringing a lot else into it.